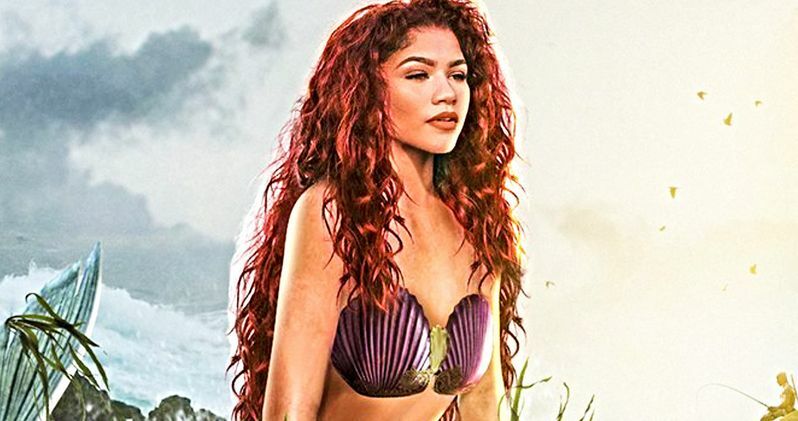 Rumors began to swirl earlier this week about Zendaya portraying Ariel in the live-action remake of Disney's the Little Mermaid, and now artist BossLogic has imagined what the young actress would look like in the leading role with a recreation of the original poster. Disney is currently hard at work to get their live-action remakes out and into theaters. In addition to The Little Mermaid, the studio is also working on Lady and the Tramp, Mulan, Dumbo, Aladdin, and The Lion King, to name a few. BossLogic's poster for The Little Mermaid remake puts Zendaya Coleman front and center, looking very much like Ariel from the original animated film. She is shown with reddish hair, a purple seashell top, and her green tail, as she looks off into the distance from a rock on the shore of a beach. As an added bonus, the Australian artist added a little picture of Deadpool fishing off of a cliff in the distance. It's not clear why he did it, but it's pretty funny. As for the casting of Zendaya in the live-action remake of The Little Mermaid, nothing has been officially announced at this time by the actress or the studio. While it's still a rumor at the moment, the response has been a bit divisive. Many posted their thoughts on social media with more than a few people angry that a woman of color could be taking on a role that is originally Caucasian in the 1990 animated version of the movie. Zendaya was also in a bit of the same controversy when she was cast as MJ in last year's Spider-Man: Homecoming. While some were not happy with the casting news, others were ecstatic about Zendaya playing Ariel in The Little Mermaid remake. One fan of the young actress claimed that he would never complain about anything again in his life if she gets cast as Ariel, while another fan thinks that Disney would be very wise to bring Zendaya on board. Even with the positive reactions, there were a still few fans that still felt the need to troll. One social media user stated. "Oh my God. Imagine Zendaya as The Little Mermaid. Jesus the racists would lose their minds and we'd get an amazing adaption, it's a win-win situation." The Little Mermaid remake is currently in development with Rob Marshall rumored to direct with a script by Jane Goldman. As for official news, Hamilton's Lin-Manuel Miranda is co-writing the music for the film with composer Alan Menken. Zendaya would be a top choice for Disney, especially considering their past relationship and her immense singing ability. The young actress/singer has voice that would be perfect to take on the lead role as Ariel, according to her fan base. For now, it's all just a rumor, but while we wait for confirmation, you can check out what Zendaya could look like as Ariel in The Little Mermaid remake below, thanks to Boss Logic's Twitter account.